Students at Bishop’s University are given many opportunities to participate in research activities. This section outlines the various opportunities that are offered to Bishop’s University students who wish to get involved in academic research. See below to learn more about research assistantships, research internships and funding opportunities, obtaining support in the graduate scholarship application process and participating in various research-related events held on campus throughout the year. Undergraduate students at Bishop’s University may have the opportunity to work as research assistants on research projects led by faculty members. 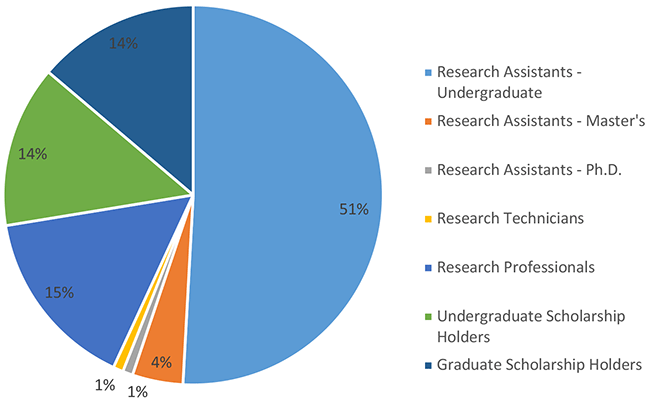 In fact, in 2017-2018, undergraduate students made up 65% of all research personnel hired at Bishop’s! Working as research assistants provides students with a unique opportunity to discover the world of research early on in their academic careers, and is a helpful stepping stone for moving on to graduate studies and applying for graduate scholarships. Undergraduate students may apply to various funding programs that allow them to undertake research internships over the summer semester. The Natural Sciences and Engineering Council of Canada’s Undergraduate Student Research Award (USRA), for example, is a funding opportunity that allows students in science and engineering to gain research experience that complements their studies. Similarly, the Fonds de recherche du Québec – Société et culture offers the opportunity to apply for an Undergraduate Introduction to Research Scholarship to undertake summer research internships in the social sciences and humanities. Finally, the Mitacs Globalink Program provides funding to students wishing to undertake a 12-week research internship in one of Mitacs’s partner countries. Thinking of applying for a graduate scholarship? It’s a good idea to get a head start and begin planning fairly early. The Research Office provides twice-yearly information sessions to students who are interested in applying – see below to find out when the next one will be held. Please note that these sessions are not exclusively destined to students in their final year. In fact, all students are encouraged to attend to learn about strategies that can be implemented throughout their entire time at Bishop’s to increase their chances of receiving a graduate scholarship. When you are ready to apply, please do not hesitate to contact Julie Frédette at julie.fredette@ubishops.ca if you wish to receive one-on-one guidance and advice. Student Scholarship Application Presentation: coming in Fall 2019.